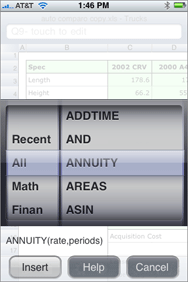 Mariner Calc is the newest entrant in the growing field of iPhone/iPod touch applications designed to let you work with and create Excel spreadsheets. I covered four such apps a while ago, along with Mobile Files Pro ( ), which includes Excel editing amongst its other features. Very Functional: Mariner Calc's function browser makes it easy to insert functions. Mariner Calc also supports undo, redo, and cut, copy, and paste—not only can you copy and paste within a file, but from one file to another. Multiple-sheet workbooks are supported, and you flip between sheets much as you flip from, for example, one city’s weather to another in the Weather widget. You can also freeze panes, and even split worksheets horizontally, vertically, or in both directions at once. Access to all of these features is through a translucent row of icons at the bottom of the window, which works reasonably well, though the spacing between the cell format, font, and formula icons is a bit tight; a couple of times, I activated the wrong feature, even though I thought I had tapped in the correct spot. Files are managed on the program’s file management screen, which worked well enough, but isn’t all that feature rich. You can’t reorganize the list of files, nor can you create folders to add a level of organization to your file collection. To transfer files onto and off of your iPhone, you use Mariner Calc’s built-in webserver, which is easily toggled on and off via a sharing button on Mariner Calc’s file management screen. Unfortunately, you can’t set a password for the webserver, so there’s a bit of risk using it in a public environment. There’s also no option to e-mail a file, so if you don’t have a computer around, there’s no way to transfer a file to someone else. You can work in either portrait or landscape mode, and use gestures to zoom the display in or out. Mariner Calc lets you zoom out fairly far, providing a good overview of your worksheet; when zoomed out, I found scrolling to be smooth enough, though Spreadsheet was somewhat smoother. With its long list of supported functions, and well-thought-out user interface, I was expecting great things from Mariner Calc. Unfortunately, the results with my four test files were far from ideal. Although the app opened my basic test worksheet perfectly, it didn’t do nearly as well with the other sheets. A loan amortization worksheet, for instance, opened with incorrect formulas in many cells—not something related to an unsupported function, but completely incorrect formulas. It also converted a number of formulas into very strange cell references—=F65552, for example. Mariner Calc did much better creating a spreadsheet from scratch directly on the iPhone. The range of formatting options available—including the ability to justify text across multiple columns—and the program’s ability to copy and paste ranges of cells made it quite easy to recreate my demo worksheet on the iPhone. Unfortunately, I ran into one fairly major issue during this test that definitely impacts Mariner Calc’s usability. While creating my demo worksheet, Mariner Calc crashed about 10 minutes into the process (one of several crashes I had while using the program) when I went to set a font face and style for a range of cells. Unfortunately, when the program crashed, I lost all my work—that’s because Mariner Calc doesn’t include any method of saving your progress other than quitting the program or loading another workbook! So if you’re building a worksheet, it’s in your best interest to occasionally close Mariner Calc, or at least close your file and open another, just to force the program to save your changes. As a user, I find this solution unacceptable. Barring the presence of a Save button, Mariner Calc should automatically save your work at certain intervals, so that if you do have a crash, you don’t lose everything you’ve done since you last closed the current file. Mariner Calc is a potentially very good iPhone spreadsheet application that’s presently hobbled by a few issues. It doesn’t support functions you may find in intermediate or advanced Excel worksheets, you can’t organize your saved files, it was somewhat unstable in my use, and you can’t transfer a file via e-mail. When creating spreadsheets—something Mariner Calc otherwise does very well—you need to be aware that your work isn’t saved until you quit the program (or close the file). With a few simple fixes to these key areas, I think Mariner Calc could quickly rise to the top of the iPhone/iPod touch spreadsheet application niche. Unfortunately, with its current issues, it’s hard to justify the $10 purchase price. Mariner Calc is compatible with any iPhone or iPod touch running the iPhone 2.1 software update.